The tournament crowned the Netherlands as European champions for the first time. Euro 88 was a rare instance of a major football tournament ending without a single sending-off or goalless draw, nor any knockout matches going to extra time or penalties. West Germany won the right to host the tournament with five votes ahead of a joint bid from Norway, Sweden and Denmark, who gained 1 vote, and a bid from England. Because the Eastern Bloc disagreed that West Berlin was part of the Federal Republic of Germany, the German Football Association ruled out playing Championship matches in West Berlin. This secured the participation of Eastern European members of UEFA. In the 1974 FIFA World Cup, however, West Berlin had hosted three games. As a compromise, Berlin Olympic Stadium did host a Four Nations Tournament in 1988, with West Germany playing against the Soviet Union, Argentina and Sweden. The first group pitted two pre-tournament favourites West Germany and Italy together, along with Spain and Denmark. The Italians had not played in the competition finals since the 1980 edition, which they hosted and West Germany won. Spain and Denmark contested the second semi-final of the 1984 edition. Spain prevailed on penalty-kicks, but lost the final to hosts, France who failed to qualify in 1988. The Germans and Italians played out the opening game. This game was tightly contested. Roberto Mancini capitalised on a defensive error on the left-hand side of the German goal and the striker squeezed in a shot from a tight angle. Just three minutes later, Italy's goalkeeper, Walter Zenga was penalized for taking more than four steps with the ball and Andreas Brehme scored the resulting free-kick. Both teams settled for a 1–1 draw. Spain defeated Denmark again, this time 3–2. Míchel opened the scoring after five minutes and Michael Laudrup equalised twenty minutes later. Spain dominated the next hour and Emilio Butragueño and Rafael Gordillo put the Spanish 3–1 to the good. A late surge saw Flemming Povlsen reduce the score line, but was not enough for the Danes, who now needed to win both their remaining games to be certain of a place in the semi-finals. In the remaining games the West Germans swept aside the Danes and Spanish. Jürgen Klinsmann and Olaf Thon scored to dispatch the former 2–0 while two goals from Rudi Völler was enough to beat Spain 2–0. The second goal was particularly notable. Lothar Matthäus ran forty yards into the Spanish penalty box before back-heeling the ball for the oncoming Völler, following up his run, to strike the ball with the outside of his foot and into the corner of the goal. The Italians won a difficult match against the Spanish 1–0, courtesy of a goal from Gianluca Vialli, a low cross-shot to the net on 73 minutes. In the last games, against an already eliminated Denmark, the Italians prevailed by two goals to nil. The second group witnessed a surprising set of results. In the opening game, one of the pre-tournament favourites England lost 0–1 to Ireland. Ray Houghton scored a looping header after six minutes after the English defence failed to clear a cross. The English applied strong pressure as the game wore on. Gary Lineker was unusually sluggish, missing a series of chances and hitting the cross bar. In the other opening game, the Soviet Union defeated the Netherlands 1–0 through a Vasyl Rats goal, despite the Dutch dominating for long periods. England met the Netherlands in Düsseldorf; both needed to win. England started strongly with Lineker hitting a post and Glenn Hoddle striking the post with a free-kick. The English defence, weakened by the absence of Terry Butcher, conceded the first of three goals to Marco van Basten on 44 minutes. Van Basten turned Butcher's replacement Tony Adams and beat Peter Shilton – playing his 100th game for England – to give his side a 1–0 lead. England rallied after the break. Lineker and Bryan Robson exchanged a kick one-two pass allowing Robson to burst into the box and lift the ball over Hans van Breukelen after 53 minutes. The score remained when Van Basten turned Tony Adams inside out to finish from 18 yards on 71 minutes. The striker pounced from close-range after a corner to seal a 3–1 win four minutes later. The Irish and Soviets led the group after two games through a 1–1 draw in Hanover. Ronnie Whelan scored a spectacular left foot volley from 18 yards to put the Irish into the lead. Oleh Protasov equalised with a low shot as the Soviet exerted late pressure. Needing to defeat the Irish to progress, the Dutch won the game 1–0 through a late Wim Kieft goal. The ball deflected into his path and he delivered a looping header which spun into the right corner of the Irish net with nine minutes remaining just after Paul McGrath hit a Dutch post with a header. In the other game the Soviets soundly thrashed England. A mistake from Hoddle allowed Sergei Aleinikov to score after three minutes. Adams equalised and England had chances to go ahead, but a goal before half time and late in the game assured the Soviet Union would finish in first place in the group. The first semi-final was significant as rivals West Germany played the Netherlands. It was only the third time the two sides had faced each other since the 1974 FIFA World Cup Final; the West Germans winning a first round match in the 1980 European Championship, and a 2–2 draw in a 1978 FIFA World Cup second round group match. The game was tight, and the West Germans broke the deadlock on 55 minutes with a Matthäus penalty after a foul on Klinsmann. The lead was held for 20 minutes until Jürgen Kohler brought down Van Basten. Ronald Koeman converted the spot-kick to level the match. With the match headed for extra time a through ball caught the Germans out and Van Basten finished clinically with a shot as he slid along the floor, beating the goal keeper and Kohler to the ball in the 88th minute for a 2–1 win. It gave the Dutch their first competitive victory against the Germans and first appearance in the competition's final. The victory was marred by the reaction of Dutch defender Koeman who wiped the shirt of Olaf Thon, given to him after the match, on his backside in front of the German fans. The player apologised afterwards. The other semi-final was another unpredictable result. Italy were strong favourites to reach the final and had beaten the Soviets 4–1 in a friendly just two months earlier. Despite controlling the play and having the majority of the chances, the Italians were undone by poor finishing, and a strong, tough opposition who sought to stop their more skillful opponents playing through hard tackles and a defensive strategy. The hard work-rate of the Soviets paid off and four second half minutes, counter-attacks saw two goals from Hennadiy Lytovchenko and Oleg Protasov. The first one from Lytovchenko was initially blocked, but quick reactions beat Franco Baresi to the ball to fire the second shot into the far corner. The second from Protasov was a looping shot which floated over Zenga for a 2–0 victory. It would be the Soviet Union's fourth appearance in a European Championship final. 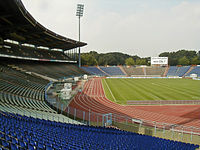 The final was played on 25 June between the Soviet Union, in what would turn out to be the nation's last European Championship match, and the Netherlands at the Olympiastadion in Munich. The Dutch won the match 2–0, with goals coming from captain Ruud Gullit and tournament top scorer Marco van Basten. Hans van Breukelen blocked a low penalty shot of Igor Belanov. Van Basten's goal would later be described as one of the greatest goals in the history of the European Championships. Results for UEFA Euro 1988 finalists. There were 34 goals scored in 15 matches, for an average of 2.27 goals per match. ^ Rob Smyth. "On Second Thoughts: Rob Smyth on England at Euro 88 | Football". The Guardian. Retrieved 24 June 2016. ^ "When Saturday Comes - Classic matches ~ England v USSR, Euro 68 & 88". Wsc.co.uk. 9 July 2012. Retrieved 24 June 2016. ^ Humphrey, Jake. "Which is the best Euro Goal Ever?". BBC Sport. Retrieved 23 October 2008. ^ "10 Greatest Goals in the European Championships". FourFourTwo. Haymarket Media Group. 8 May 2008. Retrieved 24 August 2017. ^ Magowan, Alistair (12 May 2012). "BBC Sport – Euro 1988: Valery Lobanovsky's last stand for Soviet Union". Bbc.co.uk. Retrieved 17 June 2012. ^ "European Football Championship 1988 FINAL". euro2000.org. Union of European Football Associations. Archived from the original on 17 August 2000. Retrieved 26 December 2017. ^ "UEFA 1988 Team of the Tournament". UEFA.com. Retrieved 18 March 2015. Wikimedia Commons has media related to UEFA Euro 1988.